Preformed thermoplastic children crossing symbol. 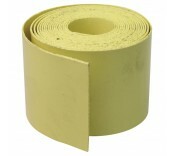 Ideal for public or private roads to make dri..
Easy to apply, preformed thermoplastic road marking material. It is ideal for fast, permanent i..
Thermoplastic White Numbers Available numbers 0 - 9 These numbers are easy ..
Thermoplastic White Letters Available numbers A-Z These letters are ea..
Easy to apply, preformed thermoplastic road marking material. It is ideal for fast, perma..
A simple, low cost solution to reinstating all markings following road repairs, without the need for..
Thermoplastic road marking primer. Helps bond thermoplastic material to concrete surfaces Tou..
Road Marking Primer 5 Litre Helps bond thermoplastic material to concrete surfaces Touch dry ..
For laying contractor road markings. Single head propane torch 600mm neck 5m high pressure ..
For laying contractor road markings. Twin head propane torch 600mm neck 5m high pressu..
For laying contractor road markings. Trebel Head Propane Gas Torch Head 600mm neck 5m high .. Perfect for permanent and temporary signage requirements, the thermoplastic road markings selection from Manchester Safety Services can help your team and the general public recognise important symbols and their significance. From crossing warnings and speed signs for roads and worksites to letters, numbers and disability signs for car parks; the Manchester Safety Services range is comprehensively stocked with products to suit a wide range of needs. Made from high quality thermoplastic materials, the road markings retain their integrity and appearance after heating and applying to a surface. The standardised symbols and signs are clear in their intent and appearance – ensuring total efficacy and immediate understanding. Alongside the physical road marking products – we also stock a selection of application tools and accessories, making it easier to efficiently and effectively implement the signs. If you require any assistance with products from the Manchester Safety Services range, please call our dedicated team on 01706 364943.